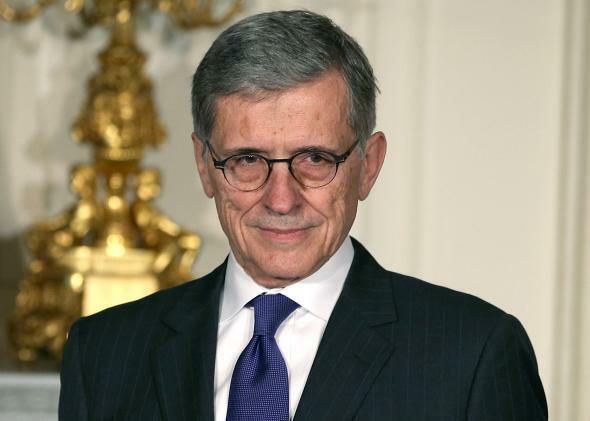 Tom Wheeler net neutrality: Is the new FCC chairman changing his tune? The new FCC chairman appears to waffle on a key component of an open Internet. Where do former cable industry lobbyist Tom Wheeler’s loyalties lie? This piece originally appeared in the New America Foundation’s Weekly Wonk. New America is a partner with Slate and Arizona State University in Future Tense. As the new Federal Communications Commission chairman, Tom Wheeler has kicked up some dust in the tech community by laying the groundwork for a grand vision for the next generation of networks but then walking back one of the key principles of net neutrality. The stakes here are your rights to an open Internet—and the ability of the FCC to ensure those rights, through net neutrality rules and beyond. Wheeler sparked the debate during remarks after a speech at the Ohio State University. Reading the tea leaves is a fun exercise, but with the FCC’s Open Internet rules (which implemented net neutrality into agency regulations) being reviewed by the D.C. Circuit Court of Appeals, his remarks are particularly important—for net neutrality and in defining how the FCC will regulate communications going forward. So, what went down? First, a few words of background. Wheeler has already demonstrated that he is not tied to previous expectations when it comes to interacting with the public. A proficient blogger on the FCC’s site, he also released an e-book in conjunction with his appearance at Ohio State. The e-book, and his prepared remarks, provide an important look into his priorities as chairman. I think we’re also going to see a two-sided market where Netflix might say, ‘well, I’ll pay in order to make sure that you might receive, my subscriber receives, the best possible transmission of this movie.’ I think we want to let those kinds of things evolve. We want to observe what happens from that, and we want to make decisions accordingly, but I go back to the fact that the marketplace is where these decisions ought to be made, and the functionality of a competitive marketplace dictates the degree of regulation. In short, he’s suggesting that high-priced express lanes on the information superhighway might be OK. For consumers, as well as for companies looking to get content to their customers through new, innovative applications or programs, this means another layer of costs added on top of an already complicated Internet market. Wheeler has since clarified that answer, and he affirmed his commitment to the FCC’s Open Internet rules in a House Energy and Commerce oversight hearing. When asked about his perceived endorsement of these “two-sided market arrangements,” he explained that he is “a strong supporter of the Open Internet rules full stop,” then went on to note that the rules were designed to reach a balance between protecting consumers and stimulating innovation. The commission’s role, he noted, was to maintain balance between those two ideas. The goal, he suggested, was to make sure that new payment schemes do not interfere with access, are not anti-competitive, and do not provide preferential treatment. That’s somewhat reassuring. However, it is difficult to not wonder whether those views expressed in the Q-and-A are not representative of his personal views on the subject. After all, Wheeler was once a top lobbyist for the cable industry. It would not be surprising for him to be sympathetic to cable’s aspirations to start charging Internet content companies directly to reach their subscribers. It’s important, however, to understand the Open Internet rules in the context of the larger Internet ecosystem, because the concerns created by Wheeler’s statement extend beyond net neutrality. Most people think of the Internet as one monolithic network. Instead, as Wheeler himself points out, it’s a “collection of networks harnessed to a common purpose.” No one entity owns it all—content travels from one user to another thanks to a series of business arrangements, where companies agree to route your movie, book, or email from one network to another. Let’s take Netflix, for example. In order for Netflix to reach Internet subscribers in the United States, it pays Level 3, a content delivery network (CDN) and backbone provider, to host and transport its content. Level 3 then has agreements with Internet service providers like Comcast and others to reach their subscribers. Prior to carrying Netflix’s traffic, Level 3 had a “peering agreement” with Comcast—meaning Level 3 could reach Comcast’s subscribers at no charge and in turn Comcast could connect with all of Level 3 customers at no charge. These agreements work when the amount of traffic flowing between the two networks is generally balanced. However, in 2010, after Level 3 signed up to carry Netflix’s video traffic, Level 3 informed Comcast that it would need more interconnection capacity with Comcast to bring Netflix’s streaming content to Comcast subscribers’ homes. In response, Comcast told Level 3 that it had to pay for that access. The ability of Comcast (and presumably other ISPs) to extract these fees has grown as streaming video and other types of data-heavy traffic have created increasingly asymmetric traffic patterns—and as cable companies more generally have substantially increased their market share of Internet subscribers. What’s the harm? For many, Comcast’s response would seem reasonable given the increase in traffic flowing onto its network. The problem is that Comcast has what we call a “terminating access monopoly”—that is, Comcast has the only direct line to a Comcast customer. This imbalance means that companies like Comcast already function as gatekeepers in these peering debates, and they have a tremendous amount of leverage to dictate the terms of such arrangements. Comcast also has another incentive to make it more difficult for CDNs to transport over its network. When the Comcast-Level 3 dispute occurred, Comcast was in the process of purchasing the cable content company NBCUniversal. That merger was approved, and the resulting Comcast/NBC entity is now an incredibly powerful, vertically integrated behemoth that owns not just the pipes, but also a large portion of the content flowing over those pipes. Meanwhile, online streaming video services like Netflix drive an increasing number of customers to cut the cord and give up traditional cable television service in favor of Internet-only plans. That means Comcast has every incentive to discriminate against companies carrying Netflix’s traffic, or the traffic of any present or future content provider that might be a direct threat to Comcast’s cable television revenues. Keep in mind that what we’re talking about so far happens even with the Open Internet rules in place. The Open Internet rules were designed to focus on the issues of priority and discrimination—or the ability of cable providers to disrupt or restrict a subscriber’s ability to access content online, either by throttling traffic, charging subscribers additional fees for access, or otherwise limiting their ability to consume the content of their choosing. The two-way payment schemes that Wheeler mentioned in his Q-and-A represent a clear example of where priority and discrimination would occur—precisely what the Open Internet rules were designed to prevent. And when examined in the context of the concerns about interconnection, that would allow ISPs like Comcast to further leverage their gatekeeper status once again to extract additional fees from Internet content companies. Basically, two-way payment schemes mean that ISPs aren’t just leveraging fees from CDNs like Level 3 and collecting monthly payments from subscribers. Now, they want to collect a third fee directly from the content providers themselves. Viewed in this light, it may be more accurate to call these arrangements “triple-dipping schemes” rather than two-way payment schemes. So, what’s next? Wheeler’s clarification of previous remarks at the House hearing and public commitment to the FCC’s Open Internet rules is reassuring. But those rules are being challenged in the D.C. Circuit Court of Appeals, and an adverse decision by the court would not only invalidate the rules but could also put the FCC’s authority in jeopardy. This could make it impossible for the FCC to implement any future policies to prevent harms that arise beyond those contemplated by the current rules. Wheeler points to interconnection as a key historical policy that drives innovation and competition. But those outcomes did not happen without some government intervention. So the question is how Wheeler will defend the historical principles he’s identified if the court invalidates the FCC’s ability to implement the Open Internet rules in whole or in part. The chairman has said that “regulating the Internet is a nonstarter,” which suggests he is already considering specific ways in which the FCC might step in. Yet determining the best regulatory path forward must be underscored by an examination of the Internet ecosystem in its entirety, and ensuring that ecosystem leads to the types of effects we would expect in a competition-driven market.